I'm a total fan of designer Amanda Jane Jones. Today I saw these designs for Turntable Kitchen and even though I promised myself yesterday I was done with internet shopping I immediately pulled out the credit card to buy the bag on the right. It turns out that the prints were only used for t-shirts. I'm way too pregnant to buy clothes right now. 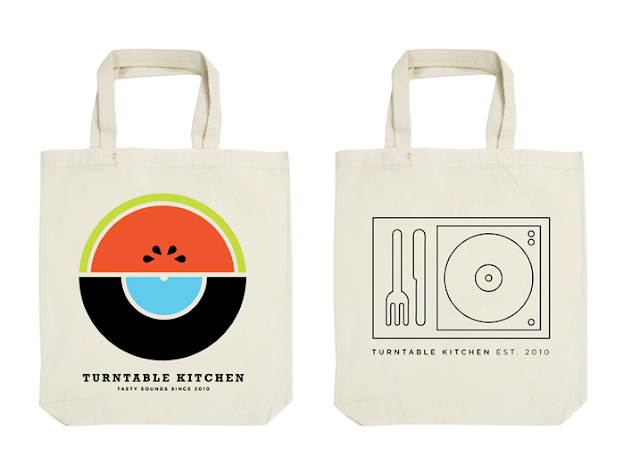 Nevertheless I was already on the Turntable Kitchen website so I decided to check it out. It's a great destination for food and music lovers. And check this out they make a monthly pairing box with curated music, original recipes, and dried ingredients, delivered to your door step. Cool much? !